The Orpheum Theatre was built in 1929, just prior to the Great Depression, as a venue for vaudeville acts. It is listed on the National Register of Historic Places. In the early years of moving pictures, the Orpheum was the place to watch these captivating films. Later, Broadway-type performances were hosted here. On this docent-led tour of the Orpheum, you'll learn not only about its history but also about the renovations that were made after the City of Phoenix took over the ownership and operation of the theatre. 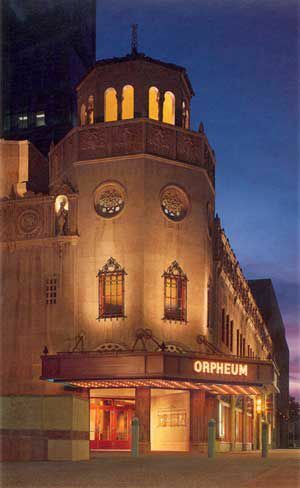 Today, the Orpheum Theatre hosts nationally known musicians, bands, performers and touring shows. You can find tickets for events at the Orpheum at Ticketmaster. I participated in one of the docent-led tours, and I can recommend it for adults; children will probably be quickly bored. The tour involves standing or sitting and listening. It doesn't cover much territory so extensive stamina is not required. When: usually the first and third Tuesday of the month, or more often during the winter holiday season. Check the calendar of events for the next tour date. Times: usually at noon and 1 p.m.
Where: The Orpheum Theatre is in Downtown Phoenix. The address is 203 West Adams Street. It is 2 or 3 blocks from METRO Light Rail. Use the Jefferson/1st Ave. station if you are coming from the north, and the Washington/Central Station if you are coming from east. The tour is offered for free. Where to Park: You'll probably have to pay for parking, and the nearest parking garage is at the Wells Fargo Building, on 1st Avenue, south of Adams. I can usually find parking on the street at a meter if I leave a little extra time to drive around, especially north of the theatre. Bring quarters for parking meters on the street. The tour lasts for about an hour, and meters cost $1.50 per hour (March 2013), so count your quarters accordingly! Reservations required: call 602-495-7139. Groups of 10 or more may schedule a private tour. More information: Visit Orpheum Theatre online. Tovrea Castle in Phoenix - What Is This Place?